The College boasts a professional coach and five floodlit, savannah style tennis courts. 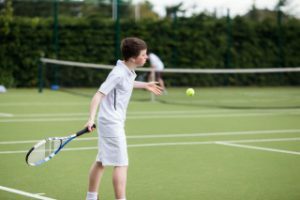 Tennis at St Vincent’s Castleknock College is managed by Brian Kearney & Co and his team of coaches. Last year (2017-18) they put tennis on a higher footing and will continue this year. We have high expectations. Balls and racquets will be supplied (though it is best to get your own racquet even tually). We have an astro with five flood-lit savannah courts. We will be entering two teams at each of Minor, Junior and Senior levels in the Leinster Championships 2019. We will also have internal competitions for singles and doubles at each level with perpetual cups for the winners. 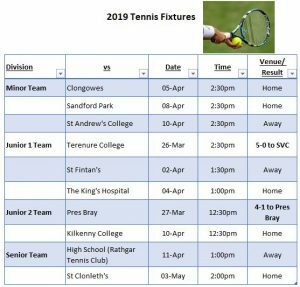 Tennis coaching is ongoing and the 2019 fixtures for this season are set out below, fixtures are subject to change.